The Dornier (ref no Do217 E-4), which had previously taken part in an attack on 2nd August 1942 on Cambridge, was brought down on September 8th 1942 by a Mosquito night fighter (Mark II DD669, from 151 Squadron, RAF Wittering). Above the village of Orwell the cockpit exploded and the bomber dived at 45 degrees over the Wimpole to Cambridge Road, then crashed into a large field at Rectory Farm. 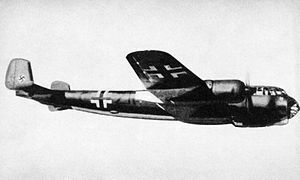 The Dornier had taken off earlier that night from Gilze Rijen in Holland, and had randomly dropped bombs and flares on University Farm at Girton and on Bourne airfield (amongst other locations). The ensuing explosion as the Dornier was brought down illuminated the surrounding woodlands and hills of Orwell, as several of the Dornier's bombs exploded. Large sections of airframe and other small pieces of the Dornier were spread over an area of about 150 yards. On duty that night with the Orwell Home Guard was Corporal Maurice Pearce; the Home Guard were warned of the German plane and that parachutists may be present. Maurice had six men under his command that night, and each was issued with five rounds of ammunition as they walked to appropriate high ground and saw the fireball as the plane hit the ground. Two Home Guard members refused to go with Maurice, so the remaining five approached the battered tail section (this was the only recognisable piece of the plane, everything else was smashed to pieces and was on fire). They decided not to get too close, recognising that nobody could have survived the crash. As they stood watching, occasional rounds of the plane's ammunition exploded. Next morning Maurice noted that the main road through Orwell was covered in British shell cases, from the pursuit of the Dornier by the Mosquito. Many of the shells were recovered by local children. None of the Home Guard detachment were able revisit the crash site as the whole area had been cordoned off by RAF Air Intelligence. Later three bodies were recovered from the wreck, and another in the next field. The pilot of the Mosquito was Pilot Officer I A McRitchie. On September 21st 1942 McRitchie received the DFC and was promoted to Flight Lieutenant. He had been with No 151 Squadron for just over a year and had been involved in several successful air combats resulting in the destruction of four enemy aircraft, with claims of two others damaged. It was 27 years before the East Anglian Aviation Society investigated in 1969, recovering some substantial parts including propeller boss and reduction gear (now in Bassingbourn's Tower Museum), with rumours that a twisted and broken machine gun had been found whilst a ditch was cleared. In 1991, there was a re-excavation, to a depth of five feet, and a mass of crumpled metal and parts were located, including engine parts and BMW badges, and airframe still covered with camouflage paint. This page was added by Derek Skipper on 17/10/2012.